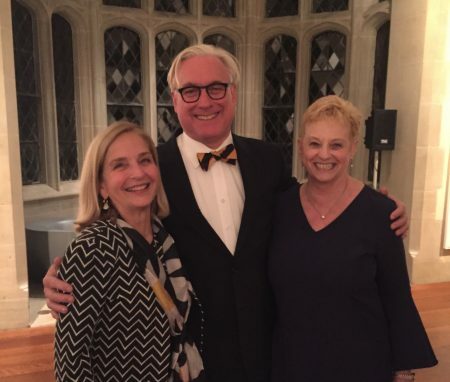 Randolph recently presented the Vita Abundantior Award to Barbara Niedland McCarthy ’73, in appreciation for her devotion to not only her career and community, but also to the Richmond, Virginia Alumnae and Alumni Chapter, her College, and her classmates. Before presenting the award to McCarthy at the special ceremony in Richmond on October 25, Randolph President Bradley W. Bateman recapped some of her lifelong accomplishments. Early in her career, she taught science at the Virginia School for the Deaf and Blind in Staunton, Virginia, and assisted blind and visually impaired adults to regain their independence through new methods at the Commission for the Blind. As director of the Library and Resource Center for the Virginia Department for the Blind and Vision Impaired until her retirement last April, McCarthy’s leadership helped the state better serve its constituents. In addition to producing textbooks in Braille and large print, she directed the statewide library for the blind, transitioned the center from audio tapes to the digital delivery of audio books, and initiated the transition of services for download and on-demand audio, Braille, and e-books. She was even invited by Senator Kennedy to testify before the Senate Health, Education, Labor, and Pensions Committee on the need to digitize textbooks for students who cannot access regular print. McCarthy is an active volunteer in her community and served on the Association for Education and Rehabilitation of the Blind and Vision Impaired in many capacities, including several years as president. A long-time board member and trustee emeritus for the American Foundation for the Blind, she has also volunteered in an advisory capacity with both the American Printing House for the Blind and with Big Brothers and Big Sisters. She also serves on several committees of the Richmond Triangle Players, a theater organization with the mission of telling LGBTQ stories, and has volunteered as a Fairy Godmother for the Make-A-Wish Greater Virginia Foundation. McCarthy’s dedication to her community has not gone unnoticed. In 2014, the Association for Education and Rehabilitation of the Blind and Visually Impaired named a scholarship for her, and earlier this summer, she was presented the Douglas L. McFarland Award for Leadership by the same organization. At Randolph, she has also made a difference with her unwavering commitment and dedication. McCarthy is always willing to offer her time and expertise, and has been an important financial supporter of the College. Among her many volunteer efforts with the Alumnae and Alumni Association, she has served as both a chapter president and president of the R-MWC & Randolph College Alumnae and Alumni Association. As president of the Association, she served on the Board of Trustees from 2008-11. She returned to the Board in 2013, and continues to serve as a trustee.